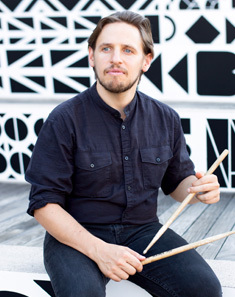 Vinnie Sperrazza is a Brooklyn-based jazz drummer. Sperrazza grew up in the Utica, New York area, the son of a drummer, and earned a degree in jazz studies from William Paterson University. While at WPU, he began a long-term musical relationship with the legendary pianist James Williams, which continued until Mr. Williams’ passing in July 2004. Through the auspices of Mr. Williams, he performed in many memorable club engagements, concerts, and recordings with such individuals as Clark Terry, Bill Mobley, Steve Wilson, Javon Jackson, Richard Davis, and Mulgrew Miller. For his latest release, Juxtaposition (Posi-Tone, 2017), Sperrazza gathered the talents of three world-class musicians; Chris Speed on tenor, Bruce Barth on piano, and Peter Brendler on bass. Juxtaposition provides a contrast of strong rhythmic and harmonic concepts with unstoppably gentle melodic sensibility which help Sperrazza to succeed in making bold statements of stunning musicianship. The album solidifies Sperrazza leadership qualities as a composer, arranger, and musician. Since moving to Brooklyn in 2002, he has made a name for himself as a leader, and has been an in-demand sideman. The Matt Blostein/Vinnie Sperrazza Band released two albums Ursa Minor (Envoi, 2006), and Paraphrase (Yeah Yeah, 2011), and performed extensively across the US in support. 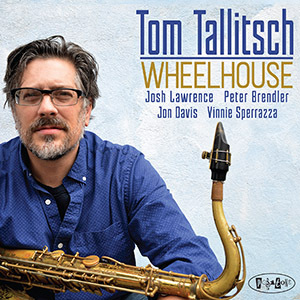 His first albums as a bandleader have been, Peak Inn (Fresh Sound, 2009), featuring Jacob Sacks and Dave Ambrosio, and Apocryphal (Loyal Label, 2014), featuring Loren Stillman, Eivind Opsvik and Brandon Seabrook. Sperrazza also has released a couple of critically acclaimed co-led albums, one titled Barcelona Holiday (Fresh Sound, 2009) with Sacks and Masa Kamaguchi, and the other, 40Twenty (Yeah Yeah, 2012) with Jacob Garchik, Sacks, and Ambrosio. Sperrazza has performed with many jazz legends and in many concerts, clubs, and festivals in the US, Canada, Japan, and Europe, including the prestigious North Sea Jazz Festival, the NYC Winter Jazz Festival, and the Tanglewood Jazz Festival, and has had favorable coverage by the New York Jazz Record, All About Jazz, Jazz Times, Downbeat and the New York Times. Sperrazza is also a dedicated music educator, and is the co-ordinator of both the Queens College CPSM Jazz Program and the JCC Jazz Program at the JCC Thurnauer School of Music, a Teaching Artist with Midori and Friends, and maintains a private practice at his home in Brooklyn, NY.